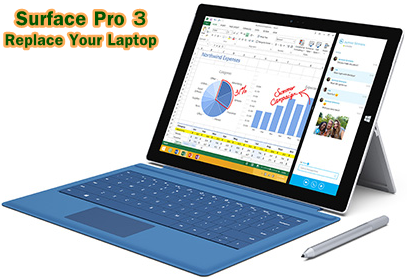 Microsoft launched new 12-inche tablets with Pen device and latest Keyboard if you want to replace to laptop, Surface Pro 3 is the best chose for you basically this Tablets is come for professionals because it has pixel-dense 2,160 x 1,440 screen full HD. Surface Pro 3 is thinnest(0.36 inch) ever device yet, which have Intel Core i7 processor and if we are talking about its weight it has lightweight (1.76 pounds). This time Microsoft try to captures those consumers who want Tablets capable enough to replace their laptops. Surface Pro 3 has all latest Spec like 12-inches Full HD display, 4th-generation Intel Core processor, 8 GB of RAM and nine hours battery backup on web browsing. All The Programs You Need. Intel Core i3, 64 GB and 4 GB of RAM. Intel Core i5, 128 GB and 4 GB of RAM. Intel Core i5, 256 GB and 8 GB of RAM. Intel Core i7, 256 GB and 8 GB of RAM. Intel Core i7, 512 GB and 8 GB of RAM. Other Features Wireless, Battery, Different Sensors,Different Ports. Cameras and A/V 5 Mega-Pixel and 1080 pixel HD front and rear-facing cameras/Built microphones, Stereo speakers with Dolby Audio-enhanced sound.